As we’re picking out flooring and finishes, we thought it would be a good idea to take images before the renovation begins so refer back to these photos to see just how far our 9th Street building has come! The building’s most recent occupant, a comedy club/martini bar/lounge, left a pretty large piece of furniture behind.The bar that they left, while it could make for a true “statement” piece in the new EPIC space, will be moved out shortly to begin our renovations. Every day that we inch closer to our move-in date, the EPIC team is getting more and more excited. 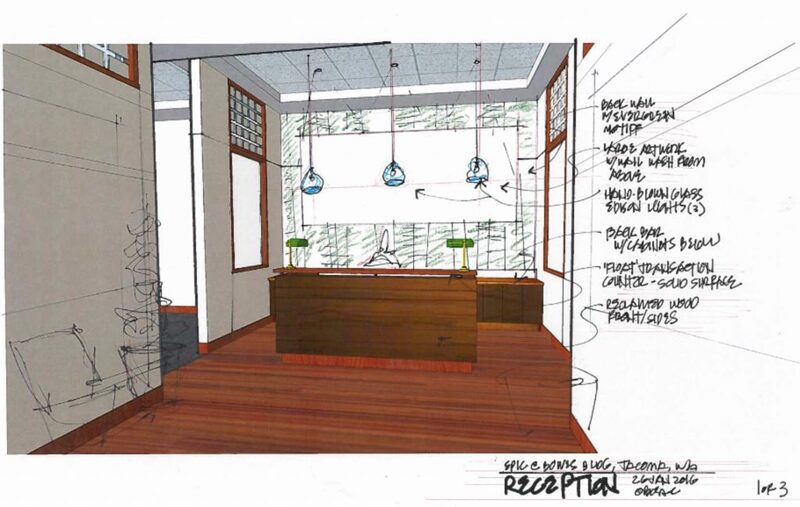 We get especially eager when our interior designer sends us incredible sketches like the one below. Be sure to stay turned for more updates on our progress!